If you want to know the “real-world” Ballistic Coefficients (BCs) of popular match and hunting bullets, confirmed by actual field testing, turn to the folks at Applied Ballistics. Since 2009, Applied Ballistics has conducted extensive live-fire testing of all major brands of rifle bullets. This has produced the most extensive and accurate collection of performance data on modern rifle bullets even compiled. Bryan Litz and his team at Applied Ballistics have spent countless hours shooting hundreds of different projectiles over multiple chronographs to determine the bullets’ true drag characteristics, and G1 and G7 BC values. And now the data set is even better. Applied Ballistics just announced that it has expanded the list of tested bullets to 533, up from 400 in 2014. The new Data Library will be supplied to all Applied Ballistics software applications. In addition, the data will appear in an updated, Second Edition of the Ballistic Performance of Rifle Bullets book, which is slated for release in 2015. The electronic version of the Applied Ballistics bullet library includes full custom drag models for each bullet. 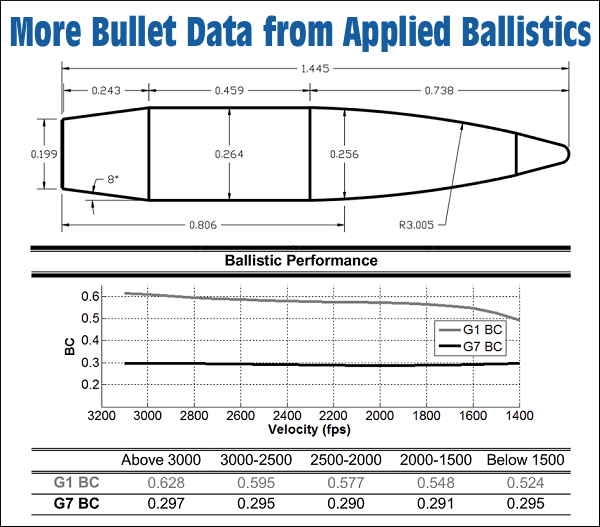 A custom drag model is a unique drag profile for a bullet, which is a more accurate model of drag than G1 or G7 referenced BCs. The Bullet Data Library now has 533 bullet models, all with custom drag models. This expanded library, which now extends to .50 Caliber, is currently available in electronic form in the Applied Ballistics Kestrel. The digital library is also in place supporting the AB Analytics desktop software, as well as the Applied Ballistics Mobile App for Android, with the iOS App coming soon. Over the next few weeks, updates to the Applied Ballistics mobile software will be pushed out to all users automatically. To get the latest bullet library for your Kestrel device, visit the Kestrel Software Support Page. Calculating firing solutions for long range shooting is often the weak link in the accuracy chain. Historically, one of the biggest uncertainties has been modeling the drag of the bullet itself. Traditionally this means having an accurate Ballistic Coefficient (BC). Recent years have seen a substantial improvement in the accuracy of BCs published by Applied Ballistics, and the use of G7 BCs. 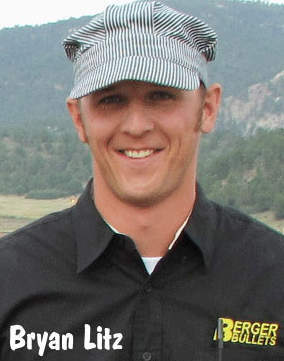 In 2013, accurate drag modeling took another quantum leap when Applied Ballistics began measuring the custom drag profiles of individual bullets, and included these custom drag models in Applied Ballistics software libraries for the AB Mobile App, AB Analytics desktop software, and the AB Kestrel. Share the post "Applied Ballistics Expands Bullet Library to 533 Bullets"
At SHOT Show 2015 Bullets.com President Shiraz Balolia signed a contract with Norma to produce a large quantity of ultra-high-quality .284 Winchester and 6mm Dasher brass. The .284 Win brass is now in the USA and it is very good indeed. Now .284 Win and .284 Shehane shooters have a true premium product, without having to neck-up 6.5-284 brass. In addition, special enhanced quality-control measures were employed by Norma (as a condition of the Bullets.com contract) to ensure this brass is very uniform and very long-lasting. Expect the primer pockets to stay tight for a long time, even with stout loads. This custom-made .284 Winchester Brass from Norma is double-drawn for body consistency and the heads are double-stamped for longer primer pocket life. This “special run” brass, created exclusively for Bullets.com, is produced to extremely high tolerances from high-grade raw materials. Bullets.com President Shiraz Balolia (left) and Norma Managing Director Paul-Erik Toivo sign contract for ultra-high-grade Norma brass. 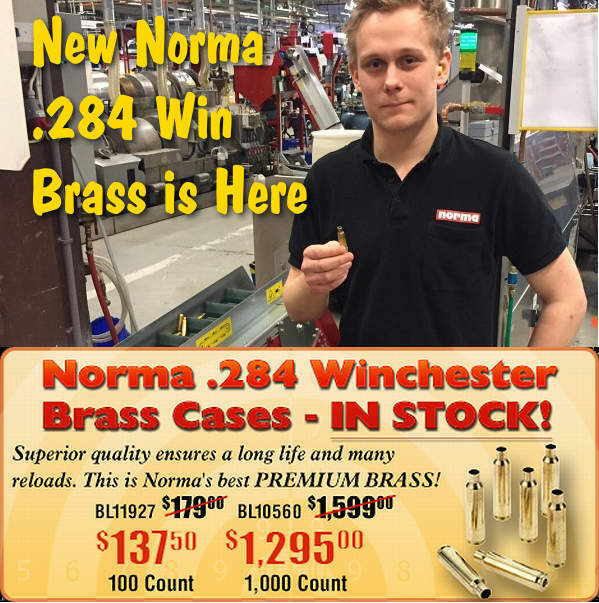 Share the post "Ultra-High-Grade Norma .284 Win Brass Now Available"